Colder weather, shorter days and the temptation to lock up your body in oversized sweaters until the new year may seem tempting but it’s no excuse not to stay active this fall. The truth is, Autumn in all its glory is not only one of the most beautiful times of the year, it’s one the best seasons to get stuck into some exercise and add some spice to your workouts. Depending on where you live in the world, the drop in temperature that Autumn brings could make outdoor exercise a lot more pleasurable than the hotter months of the summer. Whether you like to hike, bike, run or walk, try to take at least one of your weekly workouts outdoors. Not only will the crisp fresh air do you the world of good, it will allow your body to gradually adapt to dropping temperatures which makes sticking to your exercise routine come winter more likely. If you do decide to brace the cold and exercise outdoors, make sure to wrap up in breathable, moisture-wicking workout gear. Though it may give you the chills at first, once you start moving, your body will warm up and the clothing will trap in the heat. If it’s especially chilly, make sure to wear a hat and gloves to stop body heat escaping from your head and hands. With dark mornings and evenings, it’s important to stay safe when exercising outdoors. While dressing like a ninja warrior might look cool, you’ll be harder to see when out on your early morning run or bike commute to work. Be smart and invest in reflective workout clothes and decent lights for your bike. Many people exercise first thing and in the evening during the warmer months to avoid the midday heat. While that may be a great way to maintain your exercise routine during summer, it’s not necessarily suitable for autumn and winter. Waking up in the dark is tough and offers little motivation, therefore, don’t feel obligated to rise and run if you don’t feel like you can. Instead, try out a few different workout times till you find a solution that works best for you. If the lack of light and shorter days are giving you an overwhelming sense of time restraints or you simply don’t feel like going for a run, cycle or a visit to the gym, exercise at home. Your workouts don’t have to be long nor do they require much equipment to be effective and fun. All it takes is a quick 20-30 minute kettlebell or skipping workout to feel the full benefits of exercise. In spring and summer, many people focus their attention on getting beach body ready. While the results can be rewarding, it’s often a somewhat monotonous way to train. Autumn, however offers the opportunity to get creative with your workouts and goals. Instead of obsessing over your waistline, focus your attention on the physiological benefits of exercise by doing activities that you enjoy. Less light can bring on SAD and exercise is a fantastic way to lift your mood over autumn and winter. Now that summer, salads and ice creams are long gone, it’s time to get excited about cooking again. While most supermarkets do offer a variety of produce all year round, buying fresh locally sourced produce not only provides more flavour, it’s cheaper too. 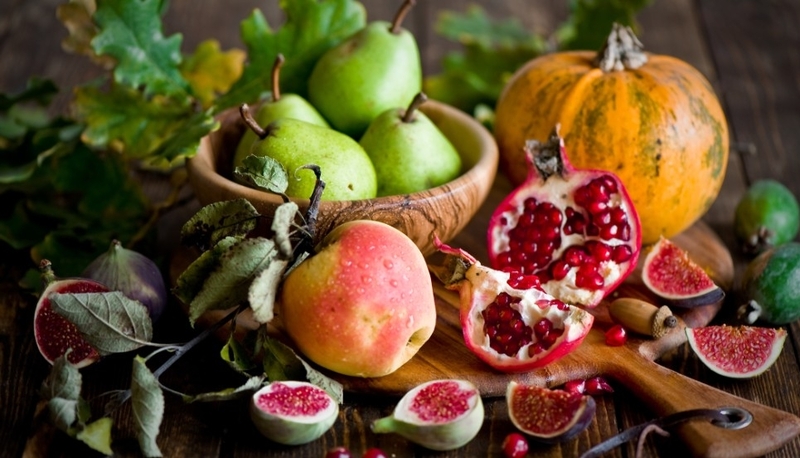 Think apples, figs, pomegranates, pears, mushrooms, pumpkins, sweet potatoes, butternut squash, beets, brussels sprouts, chili peppers, artichoke, broccoli, celery, fennel and parsnips. My mouth is already watering! With colder weather comes the winter wardrobe making it very easy to gain unnoticeable weight. While gaining a pound here and there is perfectly normal as your body looks for extra insulation, try to keep an eye on your weight. If you feel that you’re gaining too much, adapt your eating and exercise habits accordingly. Autumn exercise can not only be extremely pleasurable thanks to a more idyllic climate, it can lead the way to a happier and healthier you as the end of the year draws in. It doesn’t have to be all or nothing, nor does it require you to rise and run in the dark. Adapt your workout plan to suit you and you’ll reap the rewards of fall fitness.